As we have already seen in the previous article on different types of hair loss, alopecia can either be scarring or non-scarring. 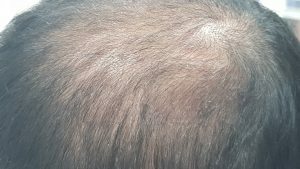 Androgenic alopecia or male pattern baldness, alopecia areata, and telogen effluvium are examples for non-scarring alopecia. Is the hair loss gradual or sudden? Whether extensive or localized and patchy? Any associated symptoms like itching, scaling, burning sensations etc? Has the patient noticed hair thinning also, in addition to hair loss? Gradual hair thinning and hair loss may be due to male and female pattern baldness. Do you feel tired all the time(anemia)? Is hair pulling test positive? In hair shedding due to telogen effluvium and alopecia areata, hair pulling test will be positive. Any history of recent illnesses, trauma, stress, medications? While doing hair pulling test, is the hair coming out along with the root or is it breaking on traction? Is there hair loss in other body parts as well?? Is there a family history of hair loss? A genetic predisposition has to be ruled out. What are your food habits? Balanced nutrition is essential for normal hair growth. How often do you expose your skin to sun? Vitamin D deficiency is an important cause for chronic hair loss and hair thinning. What is hair pulling test? This is a simple and easy test to assess the status and degree of hair loss. Hold around 50- 60 hairs firmly between the thumb, index, and middle fingers , near the base of hair shaft. Pull firmly along the direction of hair follicle. If more than 10% (5-6) whole hairs (with roots) come out from the scalp, the hair pull test is considered as positive. Shampooing should be avoided at least 1 day before. Trichoscopy (dermoscopy of hair) is very useful in outpatient diagnosis of hair loss causes. Being non-invasive it carries better patient acceptance as well. in women with androgenic alopecia, an endocrinologic profile including serum testosterone, androstenedione and dehydro-epiandrosterone (DHEA) are done to rule out hyperandrogenism. if discoid lupus erythematosus is suspected, antinuclear antibody tests are indicated. Once the diagnosis is made, a comprehensive treatment plan can be charted out.